The latest addition to Nikon's elegant Style range of compact cameras seeks to combine form and function, marrying a chic design with a glut of high-end features; all in an easy-to-use, compact package. 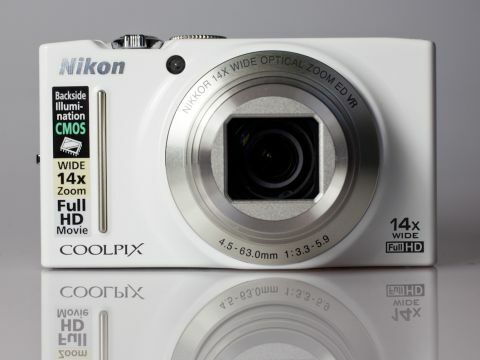 The new Nikon Coolpix S8200 - which replaces the older S8100 - was launched alongside another, lower-spec 'S' model - the S6200. Each camera comes with its own unique traits that set them apart and cater for different types of photographers. Headlining the Nikon Coolpix S8200's feature set is a 16MP back-illuminated sensor, 14x optical zoom lens with Vibration Reduction (VR) and a Full HD movie recording mode, complete with stereo sound. These make it a versatile alternative to the rest of the travel zoom compacts on the market, albeit without the GPS functionality that's offered by some pricier rivals. Rather than sporting a completely overhauled feature set, the Nikon Coolpix S8200 offers just a few upgrades over its predecessor, notably the higher-resolution CMOS sensor (16MP compared to the S8100's 12.1MP), bigger focal range (14x zoom compared to 10x) and a wider starting focal length of 25mm, offering more versatility than the S8100's 30mm equivalent wide setting. The 3-inch dimensions of the LCD display we saw on the older model remains the same on the Nikon Coolpix S8200. However, the resolution has been upped a little from 921,000 to 961,000-dots. With an equivalent focal range of 25-350mm (on a 35mm camera), the Nikon Coolpix S8200 is ideally suited to photographers who like to shoot anything and everything, with its relatively compact dimensions making it a tempting option for avid globetrotters in need of a lightweight travel-friendly alternative to a bulkier camera system.